Which Spanish Champs Kit is Best for Me? The right kit depends on your setting, the age of your child(ren), your learning goals, and how much time you plan to spend on Spanish. Starter Kit: I want my child(ren) to learn some basic vocabulary and useful phrases. I plan to spend 15 to 45 minutes per week on Spanish. Deluxe Kit: I want my child(ren) to learn basic vocabulary and useful phrases. I also want them to develop an ear for spoken Spanish. I plan to spend 30 to 60 minutes per week on Spanish. Curriculum Kit: I want my child(ren) to learn basic vocabulary and useful phrases. I also want them to develop an ear for spoken Spanish and to lay a foundation for fluency. I am teaching in a homeschool or classroom setting. I plan to spend 45 to 90 minutes per week on Spanish. Super Kit: This includes both the Level 1 and Level 2 Curriculum Kits. The Super Kit is appropriate for homes, home school groups or classrooms that are teaching a mixed population of children from beginners to those with intermediate abilities. The Super Kit will allow a seemless progression between the two levels and provides resources for 2 to 4 school years, depending on the age of the children and how much time you spend each week working on Spanish. Purchasing the Super Kit also includes the highest discount. 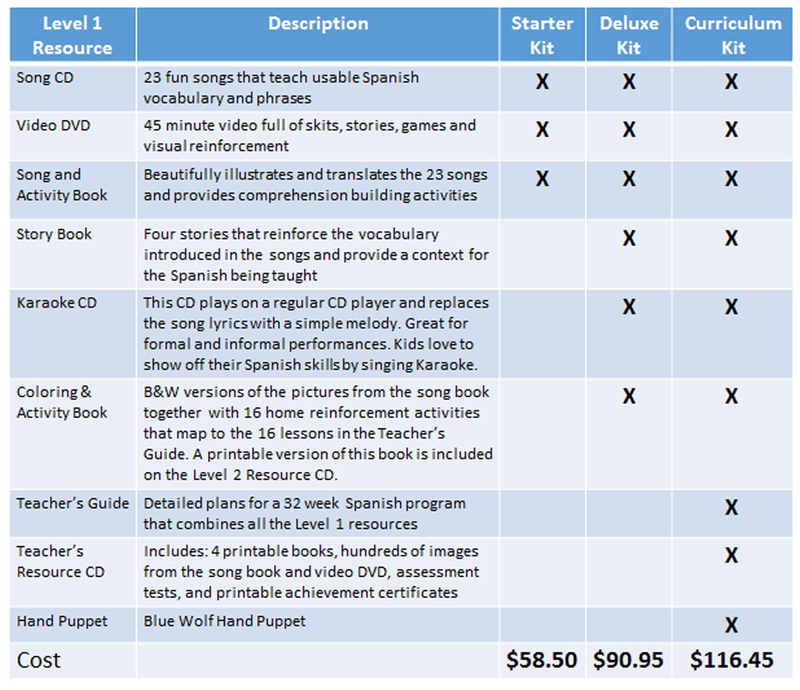 The two tables below show the resources included in each of the three different Level 1 and Level 2 kits. 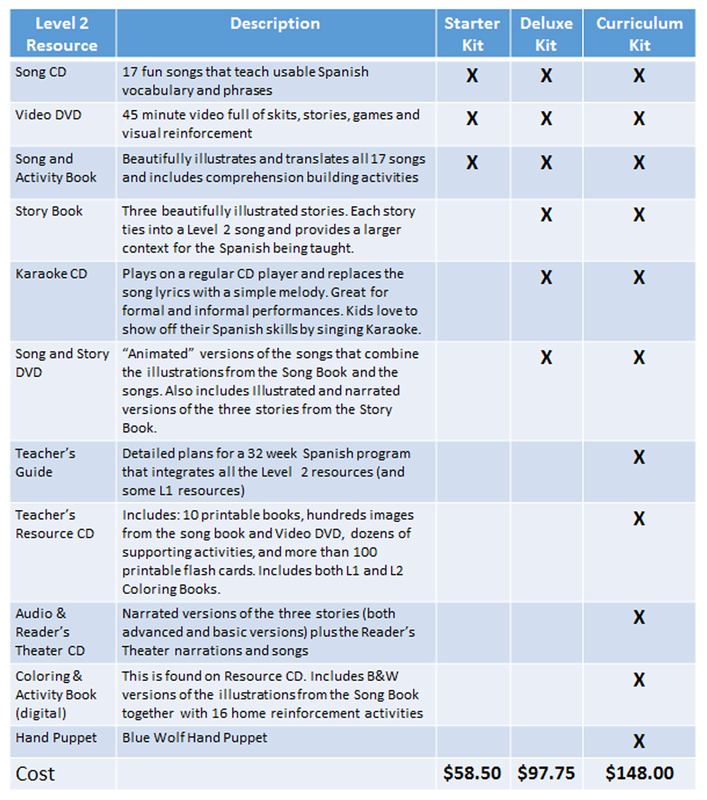 If you want a more in depth description of each of the resources, click the button to take you to the Preschool Spanish Curriculum tab. Please watch the videos at the top of the page that show and describe in detail each of the resources mentioned in the two tables. When Am I Ready for Spanish Champs Level 2? If you have used Spanish Champs Level 1 resources for one year or more, can sing and understand at least half of the Level 1 songs, and can use basic words and phrases from the songs with meaning. If your children understand and can produce basic spoken Spanish, including: greetings, numbers 1-10, basic colors, family members, basic foods, basic clothing, and basic emotions. If you have a bilingual home or classroom and are looking for dynamic Spanish resources to enhance the language immersion experience. What do each of the Level 2 Kits Include?